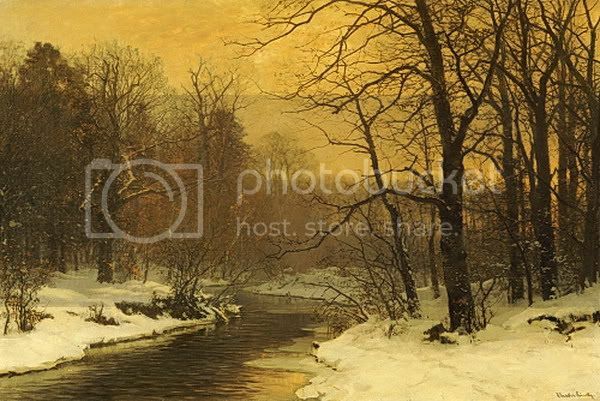 Winter Poems: 'A Winter's Day', with paintings by Thaulow and Andersen-Lundby. While it is still winter, here, anyway (it was -7 F this morning), I thought it would be good to present a couple of jan-u-wine poems set in that season. The poem below contrasts the warm home of Frodo and his parents with the frigid cold outside. It is full of just the right details to create a wonderful atmosphere. The world of the poem seems as real as the room I'm sitting in, perhaps even more real. I feel I am snuggled inside with Frodo, wrapped in familial love and savouring all the good things. Winter presses against the glass and shoulders the door, but it can't get in. *I photoshopped this painting a little, taking the peaked roof off the house to make it more like a hobbit hole. 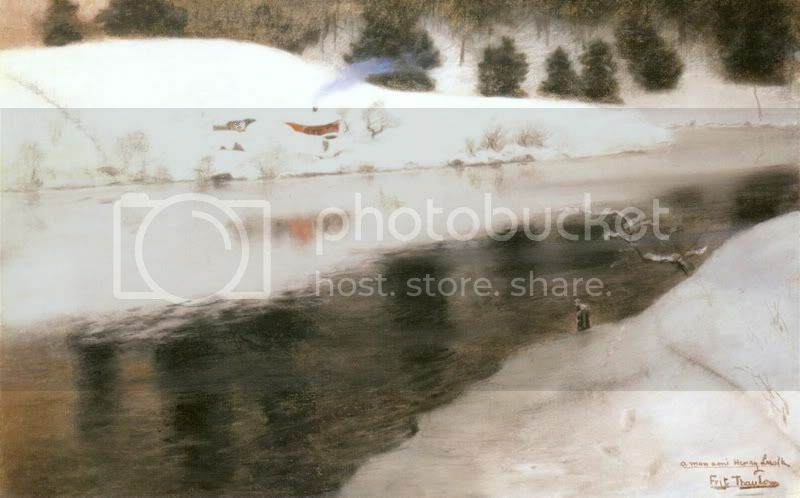 I hope Thaulow will forgive me. I chose the river painting at the bottom of the poem, 'A Winter River Landscape', for its beautiful but sombre atmosphere, the colours more autumnal than wintry. Danish painter Anders Andersen-Lundby (1840-1923), like Thaulow, was known for his winter scenes. But his specialty was painting them at sunrise and sunset, as well as in this late afternoon light. Perhaps the golden, autumnal light makes me think of the waning of Frodo's childhood happiness, his life with his parents soon to end. mingling with the deep-earth scent of the chocolate. and flew in cloudless skies. ~ jan-u-wine's "Of Mothers and Memories", plus Mary Cassatt's "Mother and Child", 10-19-10. Oh my, how utterly lovely and loving. Isn't a lovely piece? I'm so glad it touched you, Shirebound. Sweet yet so sad knowing what lies ahead for little Frodo. The paintings you chose were perfect as was the poem. Thanks to both of you. I felt as warm reading this as Frodo felt wrapped in his parents' love. I loved how the cold of winter contrasted so sharply with the warmth and love inside. Just beautiful. And those paintings you chose illustrate it so perfectly!! It really does look like a hobbit hole in the first painting!! I loved how the cold of winter contrasted so sharply with the warmth and love inside. This is so sweet! I love these wee!Frodo poems, especially Da spinning a tale, Frodo's dreams of adventures, Mum's love. Thanks for sharing this! You are welcome, Antane. I'm so glad you enjoyed this! Sighing for the loveliness of the poem about young Frodo, warm inside with his mum and da. Those really were the days, weren't they? Beautiful memories. My snow/youth memories are so old now, they're only snapshots, but they still fill me with so much longing. And so does the poem. I like the banks of the river being like arms. I love how everything on the inside of the home is *enough*, all one would need. It makes me think of how cats look when they are muffed up and purring with their eyes closed. Cats KNOW the meaning of happiness. That must be where the lyric came from in the song "Memory"... "If you touch me, you'll understand what happiness is -- "
ah, dear Lady M....thank you so much for the lovely comments. How I wish you were where you could actually see and touch the snow you love so much. Some day, my friend, some day. Until then, dream on your memory snap-shots. What better way to walk with those we love, than in those beautiful and yet faded mind-pictures? Hi, Paulie. I'm so happy you enjoyed the poem and pictures. It's another cold, gloomy day here, snow expected tomorrow. Yes, it's lovely to be indoors, safe and warm, when it's cold outside! There is so little in LOTR that lets us into any clues of how Frodo felt about his parents or his earliest memories. So it's wonderful to have such a glimpse of this special time they shared, and how glowingly it is preserved in his memory, in cherished feelings of warmth and safety. What flows very true from Jan's beautiful poem is the love his parents showed him, in embraces and in the tales, tricks and treats - small simple pleasures that wove a world of security and unquestioning happiness in his child's heart. I'm glad he knew such a time and was so adored. Thank you so much for sharing this poem and the lovely evocative paintings with us! Your choice of illustration is perfect. I especially love the second one... golden. At this time of year I can live it, waiting for the bus, on my way home from work. The fields, trees and the twilight. The glow of the poem and the glow of the paintings are wonderful. Oh, Estë, thanks so much. It's a lovely thing, the poem, and the paintings suit it well. Yes, the gold of that bottom one really captures the late northern light. I sent my Anna to Ireland/Scotland with her school choir and am catching up. My days have been hectic. THIS is so warm...the scents so loving and full. The silence is not silence but the breath of all the love in the room and senses lulled from the scent and taste and feel of warm security and tenderness. He was loved and protected. The future would be so harsh on this sweet soul. Lovely pictures to accompany these gorgeous words. "Mumma" *sighs* I love this and how she holds her son and he nuzzles into her. The last picture had the warm glows that matched the warm feeling accompanying a frigid cold reality outside. Your Anna is gone to Ireland and Scotland to sing choral music? What a wonderful opportunity! What grade is she in, if I may ask? Thanks so much for stopping into Mechtild's, Verangel. There are quite a few jan-u-wine poems being posted here, a treat for me after a long quiet spell. I love the atmosphere and mood of this piece, too. The scents, the touches, the sights, the words spoken, all of it redolent of deep, warm, mutual love. That's a fine age. How excellent to be on such a trip, singing, at fifteen going on sixteen! I love her name, by the way, "Anna".